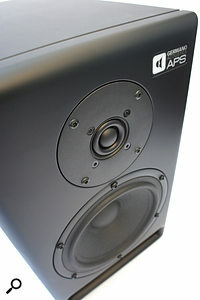 For their newest speaker model, Polish monitor makers APS teamed up with experienced studio designer Troy Germano. We've covered a couple of monitors from the Polish APS company over the last few years, and they've acquitted themselves well, delivering a good level of professional nearfield monitoring performance at a pretty reasonably price. This latest APS monitor, the Germano Aeon 2, appears to be a relatively conventional, ported, two-way active speaker sporting a 180mm paper‑cone bass/mid driver and a 19mm soft‑dome tweeter. However, like the recently reviewed Avantone Pro CLA 10, an extra level of intrigue is added by the design involvement and endorsement of a pro-audio personality. In the case of the CLA 10 it was Chris Lord-Alge, and for the APS Aeon 2, it's Troy Germano. The Germano family is probably as close to royalty as things get in the recording studio business. Troy Germano's father Ed founded the Hit Factory studio in New York and, in the mid-'80s, expanded that enterprise, in cooperation with Sony, to open a studio in London of the same name. The two Hit Factories were hugely successful and influential, and a further expansion took place in 1993 with the purchase of Criterion Studios in Miami. Around the time Ed's son Troy took over the reins, the traditional studio business had begun to contract, but he proceeded to create a successful Germano studio design and build operation, and by 2002, 16 recording/mixing rooms, six mastering suites and six writing rooms had been built under his supervision. In both 2003 and 2008 Troy was awarded the TEC Award for Studio Design, and later in 2008 he opened a new Germano Studios facility in New York's NoHo district. The new Germano studio complex has since played host to some of the biggest names in music, on both sides of the studio glass, and also plays host to a few pairs of APS nearfield monitors — hence the collaboration that produced the Aeon 2. Of course, with or without a big-name endorsement, a monitor still faces all the same electro-acoustic issues to be resolved and price-versus-performance equations to be balanced. Looking at the design and ingredients of the Aeon 2, I think its fair to say the APS/Germano approach is one of thoughtful development and careful component choice rather than any radical rethink of nearfield monitor technology or format. I'll begin my description by looking at the most obvious expression of component choice: the drivers..
£3000 per pair including VAT. Black Lion Audio +1 845 642 3697.